Black beans are one of my favorite beans to eat. I learned how to cook legumes basically thanks to our cleaning lady Rosy. She is from Peru and loves to cook. They eat tons of legumes in Peru, that is where quinoa is from too. The big fuss about preparing legumes is that you have to soak them overnight or at least 12 hours, they take almost 2 hours to cook, depending on the bean, and you can’t just leave them on the stove, you have to pay attention to the pot. Of course that is if you want to cook them yourself, otherwise just buy canned but it is more nutritious, flavorful and convenient to use dry legumes instead. So a useful thing is to make big batches of beans so that you can then use them for more meals prepared in different ways during the week or freeze them. So rosy’s typical recipe for cooking legumes is boiling them on high heat without the lid (changing the water with fresh boiling water once or twice); half way through the cooking she will sauteè an onion and garlic in a separate pan, then add some tomato puree and cook for 10 minutes. The last 20 minutes of the beans she will add the tomato sauce into the bean pot. What comes out is a wonderful pot of steaming “tomatoey” bean stew. 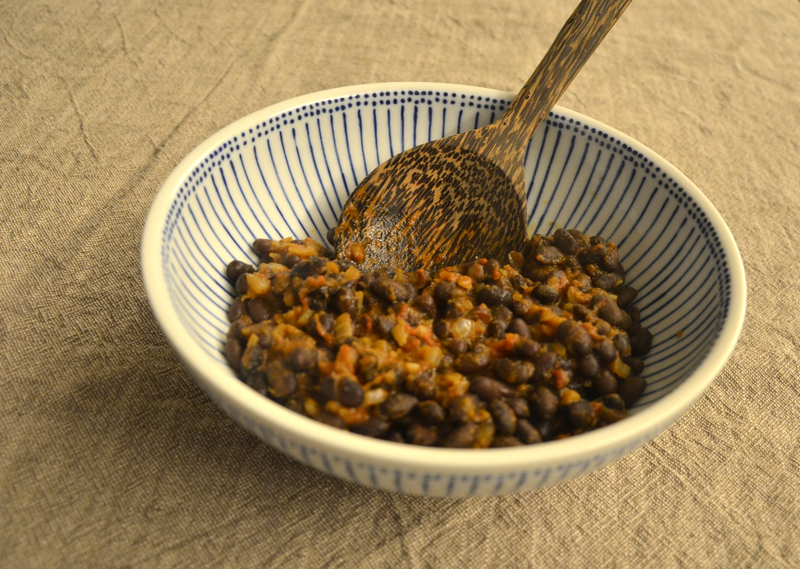 I like to use a lot of spices so that is what I do with most of legume stews, but the way I start to cook the beans will always remain Rosy’s way. Start by rinsing the beans and cooking them into a big pot with lots of water and a couple bay leaves. Take the white cooking foam off while cooking, if there is lots of foam, drain the beans and add fresh boiling water. Cook the beans until done, about 1 1/2 hours. Drain while keeping 1 cup of cooking water aside (should be black). In a separate pan, heat the olive oil and add the onion, garlic and ginger. After 2 minutes add the spices: cumin, turmeric, cayenne, and some salt. After 10 minutes add the tomato puree, the cooked beans and 1 cup of bean cooking water. Let simmer for 20 minutes until most of the liquid has evaporated. OPTIONAL: garnish with some chopped coriander. You can serve this with some rice or just a simple salad.